From the authors of Designing Team-Based Organizations, hands-on guidance for establishing or refining teams in organizations where they carry out the core work process.Though teams are fast becoming the basic foundation of businesses and other organizations, surprisingly few resources are available to help managers, leaders, and design teams organize an entire business or business unit around teams. In response to requests from their consulting clients, including Texas Instruments and Honeywell, the Mohrmans developed these step-by-step materials.Their workbook is a practical guide that combines basic concepts with dozens of valuable worksheets that team organizers can use to create a viable design plan. Attractively designed with clear graphics, sidebars, to-do lists, and diagnostic aids, the workbook details planning, design, goals, decision-making, communications, leadership roles, performance management, and more. The facilitator's guide outlines how to use the workbook with groups so that unit managers, project managers, design professionals, and human resource staffs can work efficiently with their management teams to design or redesign their groups around teams. SUSAN ALBERS MOHRMAN and ALLAN M. MOHRMAN are senior researchers at the University of Southern California's Center for Effective Organizations. 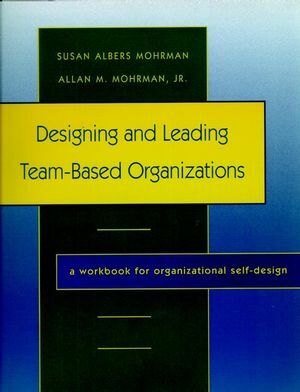 They are the authors or coauthors of several books, including Designing Team-Based Organizations and Large-Scale Organizational Change. They live in Altadena, California. How to Use This Design Workbook. Designing Management and Leadership Roles. Setting Direction Across the Organization. Building a Framework for Decision Making. Creating a Framework for Communication.